What I am going to show here is not something I'm proud of. But it is something that folks who play pretty wooden instruments should know. Take a look at these pics and notice the sort of odd stains in the wood indicated by the red arrows..
See those kinda odd looking dark stains, where it almost looks like the wood was burned or something? Those were caused by using "Lemon oil" furniture polish on the fingerboard. Furniture polish, guitar polish, violin polish, it's all pretty much the same stuff. Mineral oil (a petroleum distillate, like gasoline or transmission fluid in your car) and some stuff to either make it smell nice or that is allegedly somehow beneficial. The mineral oil is what does this. Yeah, this is an electric guitar, not a violin. But it happens to be an ebony fretboard and maple neck. 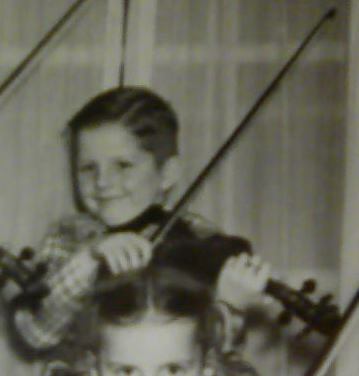 Same woods as are usually there on a violin. So what happened to my guitar can definitely happen to violins, violas, or cellos. The mineral oil soaked through the ebony over time and seeped into the maple. You might have somebody tell you "No, this stuff is good, I've used it for years.."
But it took years for the damage to start to show, probably 4 or 5 years of oiling the fingerboard every 3 or 4 months, when the wood started to look dry. And the stains have continued to slowly grow over more than 10 yrs since I stopped doing that. Some pros do oil fretboards and fingerboards. But they use tung oil or teak oil, not furniture polish. Tung and teak oil harden in a day or two so they only soak in a few cells deep before they harden and stop. For most people, it may be best to take it to a shop if you want that done, since they can probably also really mess up a nice finish if an accident happens. But any sort of "polish" will usually contain mineral oil and can eventually cause this sort of damage. It makes things shiny and pretty in the short term. That short term can be some years. But eventually it can get ugly. So what can you use if you just want to keep your instrument looking nice? I like a piece of silk. I've heard chamois is also good, but I haven't tried it. If you can't afford those, then a scrap off an old 100% cotton t-shirt. It doesn't take more than a minute or two to wipe down your instrument after playing it and give the finish a quick buff. Even better, buffing with a soft cloth will remove small scratches over time, instead of just filling them in with oil to make it look temporarily nicer. And for any of the "old hands", don't bother with telling me it was dumb using a liquid or spray polish on the guitar. I've kinda figured that out, obviously. I'm just posting this in hopes of saving some folks from making the same mistake with their instruments. I find the new microfiber clothes work great for cleaning up violins. I use pledge on my motorcycle. Shines it up nice but there is no wood to worry about. This is confusing now, in another thread you say to use oil on the fingerboard and in this thread you're saying not to, just use a cloth to keep it looking nice. Which is it ? I see no reason to use any oil or polish on a violin or guitar fb, I never oiled or applied any type of polish on any of my guitar fretboards and I've had many. @Fiddlestix: Ok, I will try to clarify. There is more than one kind/type of oil. Oil varnish (and oil paint, for that matter) are made from what are called "drying oils". Linseed, tung, poppyseed, walnut, are all drying oils. This means that they harden. They are used for finishing. They are what makes an oil varnish work. Varnish comes in two basic types. There is "Spirit varnish", which is usually mostly some material like shellac dissolved in a solvent. When it dries, the solvent (like alcohol, for example) evaporates and leaves behind the hard material to protect the wood. Then there is "Oil varnish", which is mostly made up of a drying oil. The oil hardens in a fairly short period of time by a chemical reaction with oxygen in the air. Either one can have resins or other materials as ingredients to make the finish more or less hard or flexible or affect color/tint of the finish. Either one may have been used on a "quality" instrument, and some experts prefer oil varnish for violins while others prefer spirit varnish. I don't know for a fact if one is "best". The very old instruments were oil varnish, so far as I understand it. Drying oils all by themselves can be applied to wood as a type of finish. Commonly called a "rubbed oil finish". The drying oil is applied to the wood, and it penetrates to a few cells deep (a small fraction of a mm) into the grain and then the excess is wiped off. The drying oil then hardens over the next few hours/days/weeks (how long depends on which drying oil is used) making the outside layer of wood a fraction of a mm deep harder/tougher. That is what is sometimes done on fretboards or fingerboards. It is a finishing technique that can add some toughness/protection from damage while leaving the grain of the wood still feeling close to how bare wood feels. It isn't a glossy finish like building up layers of varnish, though. Non-drying oils never harden. They basically stay liquid and will continue to seep deeper into the wood. Most furniture polish and also most of what is sold as guitar or etc polish is made up of some stuff called mineral oil. Mineral oil is a "non-drying oil" that is also a petroleum product, like the oil in your car's crankcase. It will stay liquid for many years. Such "polishes" make finished wood instruments or furniture look shinier by coating them with a thin layer of liquid oil. But because they stay liquid, over time they can creep into the grain of the wood quite deep, and give it that odd sort of "burned" look you can see in the pics I posted here. It isn't just with fingerboards that it can happen. Any place where the non-drying oil can seep into bare wood through a crack or unfinished surface of the wood can have the same problem. In both threads, I actually said the same thing. Not to use stuff like furniture polish on musical instruments. The other thread was talking about fingerboards in specific. Stuff like furniture polish, people tend to use all over the instrument. It can cause damage of different sorts, but what I'm showing here is the place where the woods are the same as what is used on a violin, to show that it can definitely cause problems with real ebony and maple. Using a drying oil to treat a fingerboard is a type of finish. It doesn't stay liquid, but becomes hard. It also will not make it into a "dust magnet" any more than varnish would. Some people prefer oiled/finished ebony and some do not. You do not, Fiddlestix. I got that. Anyway, I probably didn't explain this well enough for some folks. I'm not an expert on varnishes and finishing. I was just showing what kind of damage stuff like furniture polish can do to a musical instrument made of similar materials to a violin over a period of several years. Even if you buy it in a music shop and it has a little picture of a guitar or violin on it, that is no guarantee that it is actually good for the instrument in the long run. Here's a link to the wiki on drying oils,for folks that have an interest in the chemistry involved and etc. Thanks Daniel, that was interesting. Thanks for sharing that. I don't think I would ever put anything on my violin that isn't labeled as a violin polish. I would be afraid there might be some chemical in it that might mess up the composition of the wood and affect the tone.